What does a Digital Media and Event Producer do? 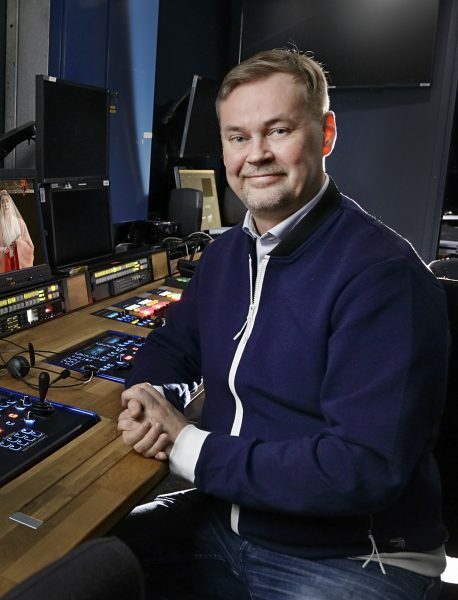 Digital Media and Events Producer Mikko Hannuksela at the live streaming control room of the Finnish National Opera and Ballet. I work for the digital media projects of the Finnish National Opera and Ballet. I’m in charge of producing the live streaming, TV and radio broadcasts of the performances, so that anyone can enjoy opera and ballet in their own living room. Our Stage24 virtual stage showcases five to ten productions per season. These broadcasts are all major projects, which require several systems working in perfect harmony. It’s up to me to link these systems together. Besides recordings of our performances and the related talks, I produce a variety of events, such as the open air performances of the Night of the Arts in Helsinki. I came to the Opera House in 2009 in a very traditional way: I saw a job advert in the Helsingin Sanomat newspaper. The Finnish National Opera was looking for a Chorus Manager. I sent my application, was invited for an interview, and eventually I got the job. Once I’d been at the Opera House for a couple of years, a new recording contract meant that we could start live streaming performances. I was immediately interested in these broadcasts, which first started in autumn 2014, and I would produce them along with my official duties. They were well received, the audience numbers were promising and the quality was excellent. A lot happened over the following years. I started to produce broadcasts full time. The Opera House bought its own recording equipment and a live streaming control room was built. Digital presence and global live broadcasts were included on the FNOB’s list of key goals. Our audience figures are growing all the time – in 2017, our live streaming broadcasts were followed by 190 000 people. At the end of that year, my current position was made permanent. Negotiations. I’m involved in all the meetings related to live streaming. It’s my responsibility to negotiate everything from which productions will be live streamed to contracts, copyright issues and media agreements. The people I negotiate with include an artists’ work group for each performance, the performing artists themselves, technical staff, and our production partners, which means either Yle or Helsingin Sanomat’s HSTV, depending on the production. I also discuss practicalities, such as the camera angles preferred by the director, which seats can be reserved for the cameras, and who will be invited to speak in the broadcast. When I’ve finished my meetings, I make practical arrangements. I reserve facilities, I act as the point of contact between the artists and the recording staff, I make schedules and ensure that everything is in order. These broadcasts are all major projects, which require several systems working in perfect harmony. What happens on the day of the broadcast? Those days are hectic and my phone doesn’t stop ringing. I make certain that the camera team finds their way in on time, that the right set-up is in place in the auditorium and the foyer, and that there’s a break room if necessary. If, for example, someone doesn’t find a parking space, a performer is late, or there is a technical problem with the broadcast, I get a call and see what can be done. After a successful broadcast I’m both exhausted and happy. What qualities are needed in your role? Organisation skills, patience and nerves of steel. You must be a good negotiator with the necessary social skills to co-operate with different kinds of people. Art and live streaming both evoke a great deal of passion. The performing artists, the director of the broadcast and the audience all bring their own points of view to the party. The aim is to make the broadcast as good as possible without any of the three having to compromise on their vision. The fact that I can be involved in doing something totally new. My work so far has always been at the forefront of digital development. Broadcast channels are evolving and that means more exposure to us. What’s more, I get to work on wonderful productions. Once of the finest so far has been Höstsonaten – Autumn Sonata. The opera was live streamed on the internet and broadcast on television, and a recording was made of the music. It was a huge and challenging project, but it was also extremely rewarding. How do you turn your mind off work in your free time? I sing in the YL Male Voice Choir and other choirs and bands. In addition to this, I enjoy exercise – going to the gym and swimming. To counterbalance my hectic and sociable work it’s good to be quiet sometimes. I can’t take my phone in the swimming pool.